Armenian Constitutional Court (CC) Chairman Gagik Harutyunyan has confirmed that the provisions recognized as unconstitutional by his ruling earlier this week continue to be in force until the National Assembly invalidates them by September 30. In an interview with the Public Television of Armenia on Thursday evening Harutyunyan explained that this extension has been given by the Constitutional Court not to put ‘legal security’ at risk. Earlier, government officials also referred to the ruling by the Constitutional Court to insist that the law will have to be complied with in the coming months. 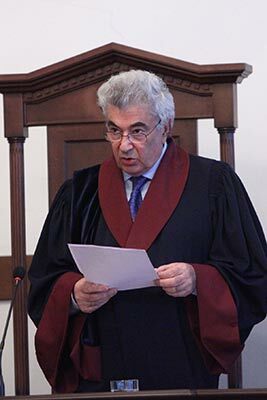 Furthermore, Justice Minister Hrair Tovmasyan insisted that the Constitutional Court’s decision did not mean that the compulsory element of the law was unconstitutional in principle, but that it only faulted a number of provisions of that section that needed to be brought in conformity with the country’s basic law. But in his interview CC Chairman Harutyunyan made it clear that the Court’s decision concerned a number of key provisions of the law that cannot remain the foundation of the reform. “There are serious pillar provisions in the law that have problems with the Constitution and the system in its current form cannot exist at least after September 30. And the period before that is for at least 50 laws to be brought in conformity with one another,” Harutyunyan explained. The opposition and civic activists campaigning against the funded pension law see the Constitutional Court’s ruling primarily as invalidation of compulsion, which they view as the key element of the law. They say the government now needs to introduce more incentives for citizens to join the cumulative funded pensions system voluntarily.